Human breast tumors stained with antibodies illustrate the possibility of sirtuin-based biomarkers in cancer. The Gius lab is working to identify potential therapeutic targets for breast, pancreas, liver and lung cancer. A group of investigators including Northwestern Medicine scientist David R Gius, MD, PhD, professor in Radiation Oncology, has discovered how an anti-aging gene directs the cellular response to DNA damage. Published in the Proceedings of the National Academy of Sciences, the findings explain the role that sirtuin 2 (SIRT2) plays in regulating a cell’s ability to recover from stress. At Northwestern University Feinberg School of Medicine, the Gius lab is focused on the connection between aging, cellular metabolism and cancer. David R Gius, MD, PhD, professor in Radiation Oncology, is using grants from the NIH and the Department of Defense to identify and validate chemopreventative agents for breast cancer. 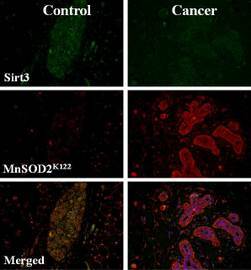 Two years ago, Dr. Gius published a paper illustrating that mice lacking the mitochondrial sirtuin, SIRT3, developed tumors, thereby defining it as a tumor suppressor. The lab has also shown that female animal models lacking SIRT2 develop breast cancer, while males develop gastrointestinal tumors, though the reasons remain unclear. 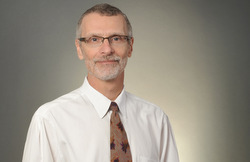 Dr. Gius will continue to study the genes, also known as fidelity genes because of their role in maintaining the structure of the genome, in an effort to validate the connections between aging and tumor growth. The work was supported by National Institutes of Health grants CA152601-01, CA152799-01A1, AG032375, Department of Defense grant BC093803 and a grant from the Paul F. Glenn Foundation.